Virtual Violence - Family Times is an award-winning magazine with staff-written news, feature stories and artwork that inform and inspire Central New York parents and their children. In our practice not a day goes by without kids or parents talking about video games, although typically for very different reasons. The kids are excited about the action and challenges of the game while parents are concerned about the depiction of violence and first-person shooting. No wonder. The Pew Research Center reported that 97 percent of youth ages 12 to17 play some type of video game and two-thirds of them play action and adventure games with violent content. A recent analysis of the games rated by the ESRB found more than 50 percent of rated video games contained violence and 90 percent of all rated games were approved for age 10 and over. However, new research has begun to question the validity of this attitude. Federal crime statistics suggest that serious violent crimes among youth have declined since 1996 even though video game sales have skyrocketed. vulnerable to becoming more aggressive after playing violent video games. The large majority of children are not affected. “Violent video games are like peanut butter, they are harmless for the vast majority of kids but are harmful to a small minority with pre-existing personality or mental health problems,” according to Christopher Ferguson, Ph.D., of Texas A&M International University. And Cheryl Olson, Sc.D., of Massachusetts General Hospital, writes that some new studies suggest boys in particular are attracted to video games not for violent content, but to compete with their friends to win the game. While these findings might ease parents’ concerns about video games and aggressive behavior in their children, it’s reasonable for parents to be involved in their children’s choice of video games. Here are some suggested guidelines. “trailers” that show actual clips taken from the games. Your kids can likely show you where on the Internet to find a video game trailer! • Take a little time to play video games with your children. According to Patrick Markey, Ph.D, a collection of traits can point to those children most likely to become hostile after playing violent video games. Those traits are: high neuroticism (easily upset, angry, depressed, emotional), low agreeableness (little concern for others, indifferent to others’ feelings, cold) and low conscientiousness (break rules, don’t keep promises, act without thinking). • There is a lot of variability between children and their reactions to video games. Observe how your child reacts to the game play. Some children become very frustrated trying to “beat a game” or having do a “level” over and over. They simply do not have the maturity and skills to reasonably handle the frustration. These children may be better off taking a break from this activity altogether for a period of time. • Children with older siblings in one study were twice as likely as other children to play mature-rated games, according to Olson. Just as you may monitor the movies your younger children watch, make some arrangement to limit your underage child’s exposure to video games older siblings may be playing. 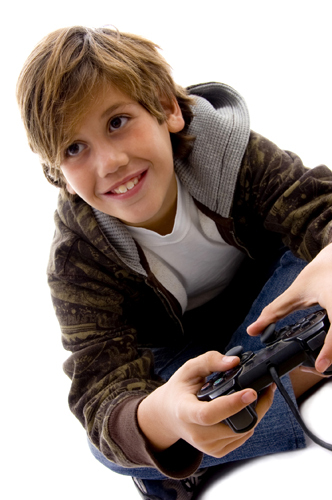 If you child does “sleepovers,” you might want to inquire about their video gaming activities. • Keep the video games and computers out of your child’s bedroom. Keep gaming in common areas of the house where you can check to see what the kids are doing. We regularly hear of situations where children with gaming systems in their bedrooms play games into the night without their parents’ knowledge. All parents are familiar with what lack of sleep can do to a child’s temperament and behavior, not to mention school performance. • The American Academy of Pediatrics recommends keeping total screen time including TV and computers to two hours a day. • Continue to encourage your children to be involved in activities that involve direct interaction with their peers, and help them make physical activities part of their regular routine. New research on violence in video games and its effect on children’s behavior may reassure concerned parents. Establishing rules about where gaming occurs and how much time is spent on the activity, as well as monitoring your particular child’s reaction, are ways for parents to be informed and involved in this common childhood pastime.